Azure Advisor is your free, personalized guide to Azure best practices. It analyzes your Azure usage and configurations and helps you optimize your resources for high availability, security, performance, and cost. We’re constantly adding more to Advisor and are excited to share a bundle of new recommendations and integrations so you can get more out of Azure. Table statistics are important for ensuring optimal query performance. The SQL Data Warehouse query optimizer uses up-to-date statistics to estimate the cardinality or number of rows in the query result, which generates a higher-quality query plan for faster performance. Advisor now has recommendations to help you boost your SQL Data Warehouse query performance. It will identify tables with outdated or missing table statistics and recommend that you create or update them. Data skew occurs when one distribution has more data than others and can cause unnecessary data movement or resource bottlenecks when running your workload, slowing your performance. Advisor will detect distribution data skew greater than 15 percent and recommend that you redistribute your data, and revisit your table distribution key selections. Enable soft delete on your storage account so that deleted Azure Storage blobs transition to a soft deleted state instead of being permanently deleted. When data is overwritten, a soft deleted snapshot is generated to save the state of the overwritten data. This allows you to recover in the event of accidental deletion or overwrites. Advisor now identifies Azure Storage accounts that don’t have soft delete enabled and suggests you enable it. 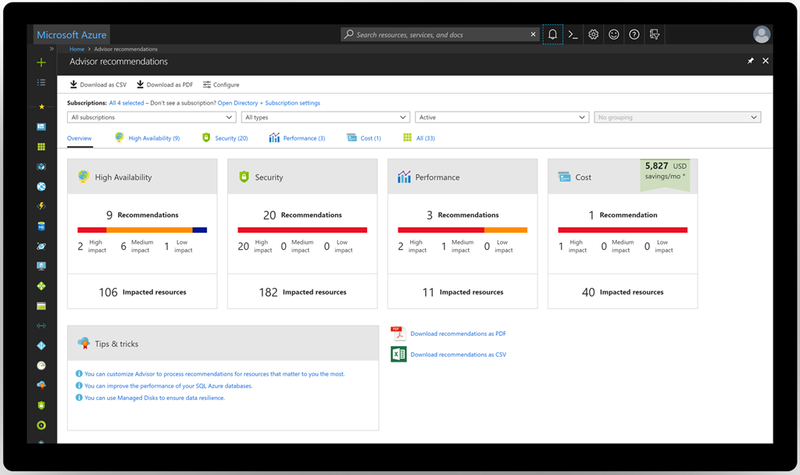 Azure Resource Manager (ARM) is the most up-to-date way to manage Azure resources, with template deployments, additional security options, and the ability to upgrade to a GPv2 account for utilization of Azure Storage’s latest features. Azure will identify any stand-alone Storage accounts that are using the classic deployment model and recommend migrating to the ARM deployment model. Customers using Microsoft Peering for Office 365 should have at least two ExpressRoute circuits at different locations to avoid having a single point of failure. Advisor will identify when there is only one ExpressRoute circuit and recommend creating another. When you are viewing your VM resources, you will now see a notification if you have Azure Advisor recommendations that are related to that resource. There will be a blue notification at the top of the experience that indicates the number of Advisor recommendations you have and the description of one of those recommendations. Clicking on the notification will take you to the full Advisor experience where you can see all the recommendations for that resource. 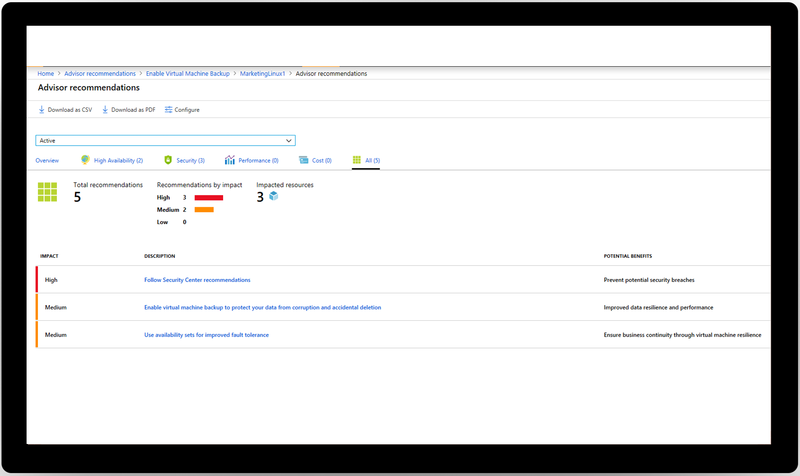 Azure Advisor recommendations are now integrated in the new Azure Cost Management experience that is in public preview for Enterprise Agreement (EA) enrollments. Clicking on Advisor recommendations on the left menu will open Advisor to the cost tab. Integrating Advisor with Azure Cost Management creates a single location for cost recommendations. This allows you to have the same experience whether you are coming from Azure Cost Management or looking at cost recommendations directly from Azure Advisor. 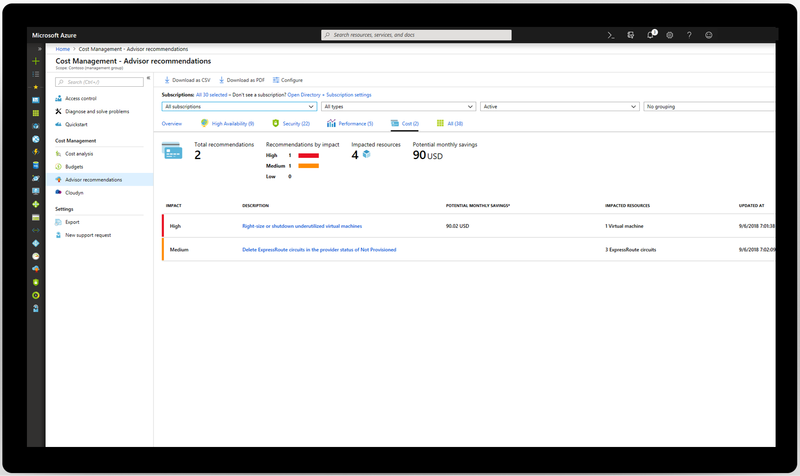 Learn more about Azure Advisor and review your Advisor recommendations in the Azure portal today to start optimizing your Azure resources for high availability, security, performance, and cost. For help getting started, visit the Advisor documentation.